Hydrangeas are the belle of the summer garden, providing splashes of color at a time when few other shrubs are in flower. These are not your grandmother’s Hydrangea. In recent years plant breeders around the world have been focusing their efforts on creating new varieties. Their work has resulted in colors, flower types, growth habits and garden performance that were unheard of a generation ago. Several species make up the genus Hydrangea and within each species, there are many distinct varieties. H. arborescens is famous for their large, snowball-like blooms. The most common variety is ‘Annabelle’ recognized for its large, tight, symmetrical white blooms. ‘Incrediball’ is a newer arborescens variety that has stronger stems. All the arborescens varieties can tolerate full sun to full shade conditions and are hardy to zone 4. Arborescens varieties bloom on old and new wood. They can be pruned in the fall or spring, but when left through the winter the dried blooms add winter interest to the garden. The most colorful of all the species is H. macrophylla. The mophead varieties are the most popular because of their gaudiness, but lacecaps with their flatter flower heads are gaining popularity. Macrophylla are unique because most set buds in the fall and overwinter them. Although root hardy to zone 5, a hard winter can kill buds and curtail flowering. An early fall or late spring frost may also affect flowering. Adding a light mulch in the fall may improve bloom reliability. Plants of the Endless Summer Collection, such as ‘Twist-n-Shout,’ or the newest addition ‘BloomStruck’, bloom on both old and new wood. This means that plants whose blooms are killed in the winter can still generate new buds from their base. Pruning is best done after they leaf out in the spring and remove only the dead stems. One of the most interesting characteristics of macrophylla hydrangea is their variable flower colors. For this type of hydrangea, the bloom color is determined by the pH of the soil. In Chicagoland, our soil pH is generally high (or alkaline) so the flowers tend to be pink. In high pH soils aluminum, the element that determines blue flower color is unavailable to plants. To turn macrophylla hydrangeas blue you need to lower the pH in the soil to make it more acidic. We recommend amending your soil with Espoma Soil Acidifier and organic materials such as pine fines, pine needles, or decomposed oak leaves before planting to help change the flowers to a lavender or blue color. 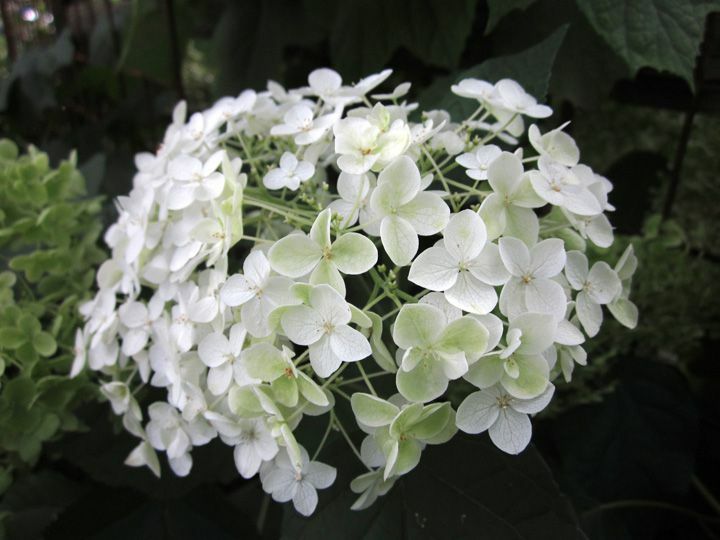 The varieties of the species H. paniculata, named for their lacy, conical flower heads, are the hardiest hydrangea and well suited to Midwest climate and soils. The paniculata varieties are versatile in the landscape because they are available in a wide range of growth habits from the 2-3’ tall ‘Bobo’, to 6-8’ tall ‘Quick Fire’, and sizes in between. Flowers produced by most of the paniculata varieties open a brilliant white and then turn to hues of warm pink. Two exceptions are ‘Limelight’ or the smaller ‘Little Lime’, which start out chartreuse, then turn white, and fade to a subdued antique pink. Note that pH doesn’t affect the flower color of paniculata varieties. Since paniculata bloom on new wood, it's best to prune in early spring. H. quercifolia or Oakleaf Hydrangea are known for their wonderful fall color and oak-shaped leaves. A great variety for smaller gardens is ‘Pee Wee’. It grows to around 3-4’ and in the fall leaves turn a striking reddish-purple. Flowers start as a white, fade to pink and dry to a papery brown. Oakleaf Hydrangea prefer moist well-drained soil. Prune this type of hydrangea after it flowers and only to control the size (if necessary). Because this type blooms on old wood, their buds are set on the previous year’s growth. If you cut them down in the spring, you will remove flower buds for the coming year. Hydrangea is an interesting and varied genus and this is but a brief overview of four species of Hydrangea intended to whet your appetite for learning more. I’ve left untouched several additional species, not touted Hydrangea fall and winter beauty, their use as a cut flower, or the tree-forms available. There are many great books and articles on the subject, but the best way to learn is to start growing them and behold their beauty yourself.